The Italian veteran battles past Daniel Gimeno-Traver in the singles final. 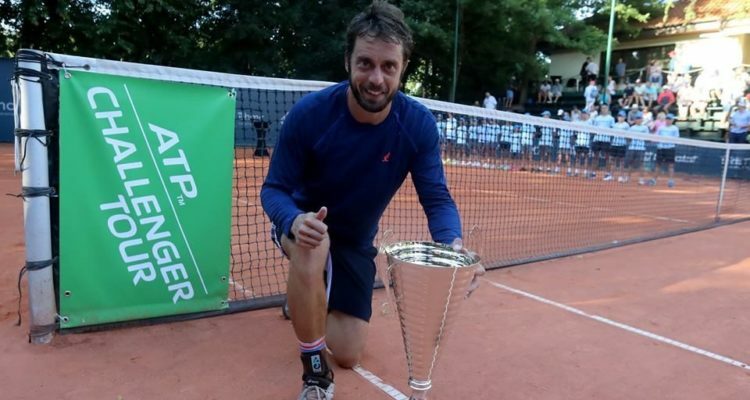 Paolo Lorenzi is the champion of the inaugural Sopot Open, which has returned to the ATP Challenger Tour for the first time since 2011 with new tournament director and former doubles player Mariusz Fyrstenberg. The No. 2 seed from Italy fought past No. 7 seed Daniel Gimeno-Traver of Spain 7-6(2), 6-7(5), 6-3 in Sunday’s singles final of the €64,000 clay-court event. Lorenzi sent down five aces, winning 54 per cent of the total points played to prevail in just under three hours of play. The 36-year-old Rome native lifted his 20th ATP Challenger crown. Lorenzi joins 29-time titlist Yen-Hsun Lu and 22-time champion Dudi Sela as the only players in the ’20 Titles Club’. Lorenzi takes away €9,200 in prize money as well as 90 ATP-Ranking points. The veteran will next play at the Isar Open in Pullach, where he will be seeded fourth. Earlier in the day, Mateusz Kowalczyk and Szymon Walkow delighted the home crowd taking the doubles crown. The all-Polish combination upset No. 2 seeds Ruben Gonzalez from the Philippines and Nathaniel Lammons of the United States 7-6(6), 6-3 in the final. The encounter lasted one hour and 13 minutes. This entry was posted in ATP Challenger News, ATP Challenger Tour and tagged ATP Challenger Tour, Paolo Lorenzi, Sopot Open.